Tools: Adjustable wrench; C wrench; flat-head screwdriver; Phillips screwdriver; penetrating oil (WD 40 or CRC); replacement washers; O-rings; snips or scissors. Choose a new faucet at your local plumbing or hardware store, gather your tools, and let’s get started. 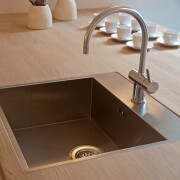 In general, think about how you use your sink, what will make your life convenient and what fits within your budget. Sink faucets are available in one-handled, two-handled, and hands-free models. The price for a new faucet can vary from less than $100 for a basic model to hundreds of dollars depending on the material, the brand, and accessories. Consider the height of the arc of the faucet. Too short an arc can be a nuisance when trying to fit tall pans under the tap. Take a look at a variety of sprayers that often come with faucets. There is no one-size-fits-all; it all depends on your needs and your kitchen. 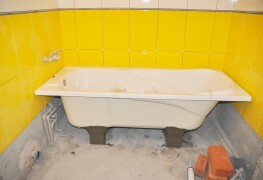 Place a bucket or some rags under the sink to catch any water still remaining in the pipes. Before removing the existing faucet, shut off the water. Under the sink, disconnect and remove the old faucet supply lines and expose the holes in the sink. 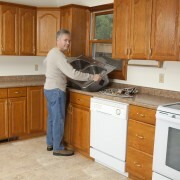 Cut any existing plastic sprayer line from the faucet with a pair of snips or scissors. 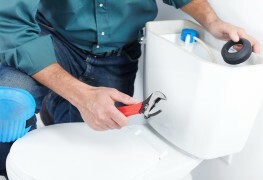 Use a wrench to loosen both the hot and cold water supply lines. Unscrew the lines from the faucet. Snap a picture of the current installation before disconnecting your sink faucets. You can refer to this when reconnecting the supply lines later. On the sink itself, unscrew and remove any bolts that are holding the existing faucet in place. If there is a separate sprayer attachment, unscrew and remove this as well. 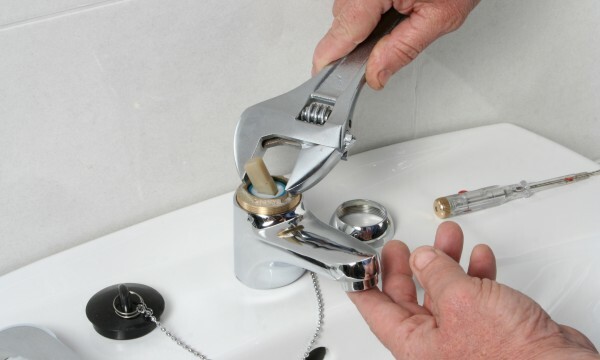 Clean up any old plumber’s putty or other sealant that remains around the area where the old faucet was and remove any dirt or grime on the sink. Removing the old faucet is sometimes the hardest part of the job. If there are corrosion problems, this is where they will show up. Also, some nuts and bolts may be hard to access or, especially in older homes, the supply lines may be difficult to reach. Apply plumber’s putty to the underside of the faucet cover. Firmly place the cover down over the three centre holes on the sink. Fit the new faucet through the hole in the cover and position the faucet so that the handles face in the correct direction. Most new kitchen faucets come with installation instructions. Follow these carefully for any unusual or novel faucets that may require special handling. Refer to your photo from step 1 when reconnecting the supply lines. If there is a spray hose, connect it to the underside of the faucet by snapping on the spring clip. Connect the hot and cold supply lines to the appropriate lines on the faucet. Tighten the nuts that connect each supply line to the shut-off valves and faucet. Remove the aerator from the faucet. Turn on the water and run it through the faucet without the aerator to clean out any dirt or debris in the lines. Check for leaks and clean up.